We will also be looking closely at how much money has been wasted on publicity and advice surrounding this whole campaign. This entry was posted in Update on February 24, 2015 by rowley fields forever action group. Just a reminder to those of you who are members of the Trust to please attend the EGM at 7pm on 2 March at the Arts House in Rother Street. IF YOU CANNOT ATTEND PLEASE DO NOT WASTE YOUR VOTE AND NOMINATE A PROXY VOTER . Nominating a proxy is really easy. Just use the form sent to you by the Trust. If possible nominate a friend to attend on your behalf. They don’t have to be a member, but they should take ID. Otherwise the Chair will act as your proxy. In both cases ensure you tick how you want your vote to be cast. If you don’t tick the box, the Chair or your proxy will decide which way to vote! The Trust must have received your proxy form in their offices by 5pm 27 February 2015 otherwise it won’t count, so send it off today. This entry was posted in Update on February 17, 2015 by rowley fields forever action group. This entry was posted in Update on February 4, 2015 by rowley fields forever action group. becoming a member of the Town Trust by completing the application form on the Trust’s website. Membership is free. Get the application form here. attending the two consultation meetings that the Trust is holding at Stratford Arts House between 3pm and 8pm on 3 February and 9 March 2015.
join us by emailing rowleyfieldsforever@yahoo.co.uk. The newspaper shop on Clopton Road has a box with papers in so that you can sign a petition and leave it at the shop. Alternatively you can use the get involved section on this site. We look forward to your support. A map of proposed development is shown below. This entry was posted in Update on January 18, 2015 by rowley fields forever action group. The Rowley Fields Forever Action Group have been quick to react to the letter from the Chief Executive of the Town Trust in the Herald on 24 October 2013 which accused residents of ‘ a fundamental misunderstanding’ of the Trust’s plans for 7 Benson Road and the land behind. The Group believes it fully understands the plans of the Trust which is why there is so much concern. The Action Group’s comments are included on the front page of the Herald this week. For the article please go to here. One of the Group’s key concerns is that the Trust has failed to comply with Charity Commission guidance concerning consultation with beneficiaries in advance of purchasing and/or disposing of land. The Chief Executive’s letter in the Herald fails to address this. Further coverage is included in the letters page of the Herald this week with a beneficiary writing in questioning the Trust’s decision to ‘sell the family silver’. Thank you all for your support to date. Please continue to post comments or email through the get involved page where a summary of the support received is shown. This entry was posted in Press Coverage on November 2, 2013 by rowley fields forever action group. Houses to be built on Welcombe Hills? Stratford Town Trust have sold (subject to contract) some beautiful land near the Welcombe Hills for housing development together with a house they bought in January 2013 for over £615,000 on Benson Road. The Trust own most of the land between the top of Welcombe Road and Maidenhead Road which borders on the Welcombe Hills and development of any part of this land may lead to all of it being a housing estate in future. Do Stratford residents want this land developed? Should the Trust be risking beneficiaries’ money in this way? Why didn’t they ask us what we think – after all if you live in Stratford you are a beneficiary and according to the Charity Commission should have been asked. To find out more and make a stand against this proposal please read on and get involved. For headline article in Stratford Herald 10 October 2013 go to here. This entry was posted in Update on October 14, 2013 by rowley fields forever action group. ALARM was voiced this week that Stratford-upon-Avon Town Trust is planning to sell land for development purposes in one of the town’s most desirable residential areas. The trust has announced that it wishes to sell 1.48 acres it owns in Benson Road, on the edge of the Welcombe Hills. 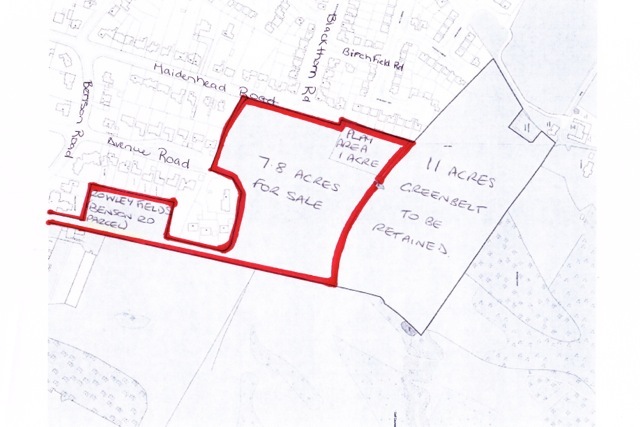 In an advertisement in a recent issue of the Herald this was described as a “freehold residential development opportunity”, subject to planning. This entry was posted in Press Coverage on July 22, 2013 by Tim.